Rizeon was set up in 2005, and builds machines to order. This keeps costs down, and allows you to specify a machine to match your needs. The Rizeon Z9400L (£599 inc. VAT) is worth consideration, due to its tough chassis, reasonable specification but mainly due to its great price. At the heart of the machine is an Intel Celeron M 380 processor, which runs at 1.6GHz. This helps to keep costs lower than the other machines, and although an older solution, we found applications loaded quickly and smoothly. It achieved a MobileMark 2005 score of 208, and we were impressed by how quietly the machine ran. The one concern with such a chip is its future-proofing, while it'll run Windows Vista, should you choose to upgrade, it won't run the full multimedia features. You'll find a standard 15-inch TFT screen with a 4:3 aspect ratio, and a native resolution of 1024 x 768 pixels (XGA). Images were clear, but you'll need to turn the brightness up to make the most of the display. 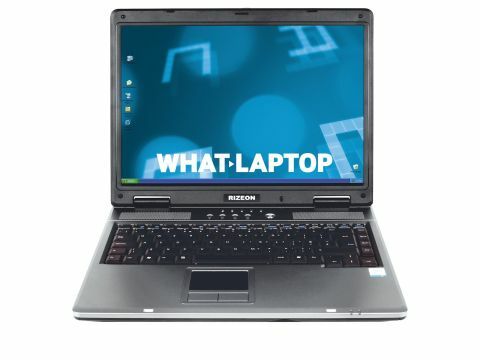 Rizeon has supplied the machine with a dedicated graphics card - the ATi Mobility Radeon 9700. This is an older card, superceded in recent times by the X-Series. Capable of handling some older 3D games, performance is in line with the latest integrated solutions. The chassis is constructed from resilient plastics, resulting in a sturdy machine. The keyboard is of a good size and sits in the centre of the laptop. The keys could use a little more travel, but were highly responsive. The only area that really let this machine down is its battery life. Under test, the Z9400L ran for 113 minutes. With an overall weight of 3.2kg, this machine isn't designed for mobile use. The Rizeon Z9400L proved to be a surprisingly pleasing machine. Undercutting many of the machines in this test, it's a good choice for those on a smaller budget.